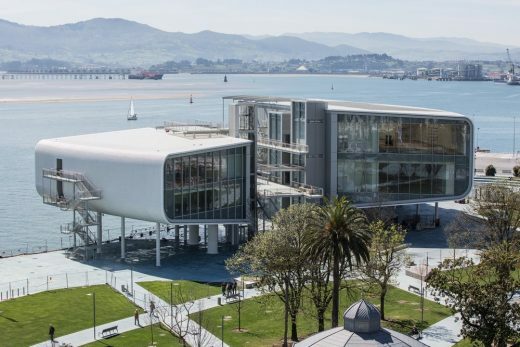 Centro Botín, designed by Pritzker Prize-winning architect Renzo Piano as a permanent home for the art, cultural and educational programmes of Fundación Botín, Spain?s most important private cultural foundation, will open in Santander on Friday 23 June, it was announced today. This will be the first building by Renzo Piano in Spain. The 10,285 sq m. Centro Botín is located on a landmark site on Santander?s waterfront, reclaiming for the city an area formerly used as the Ferry car park. The building, raised above the ground, frames spectacular views of Santander and the bay and is covered with a unique surface of 270,000 ceramic discs that reflect the changing colours of sea and sky. The building includes 2,500 sq m. of exhibition galleries, a 300-seat auditorium, classrooms, work spaces, an informal restaurant called El Muelle, created by two-Michelin star chef Jesús Sánchez, a shop, and a rooftop terrace offering a new vantage point overlooking the city and the bay.